Ko Joo-hee, left, with Kwoen Han-na on her back, plays in the water at Ala Moana Beach Park. The children are heads of their households in Korea and were brought to Hawaii for a rare vacation. Kwoen Han-na splashed along the shoreline at Ala Moana Beach Park without a worry in the world. She is a typical fourth-grader in Korea, with one exception. Kim Ja-yeon was a baby when her mother abandoned the family. Her father turned to alcohol, providing minimal care for Ja-yeon, her two brothers, a sister and grandmother. He died a few years ago of alcohol-related disease. The children moved in with an uncle, but his own alcohol problem and abusive behavior led him to jail. For a while, their grandmother was able to sell produce at a market to earn enough to survive, but now that she has arthritis, the children have taken over the household. Ja-yeon is 16, and like her siblings -- ages 15 to 18 -- she is trying to finish school. Grandma is 78. "I need to make money," Ja-yeon said. She plans to become a hairstylist. "I like to make things look nice, and the job will not affect daily activity. I can be flexible." At the age of 11, Han-na was forced to take on the role of head of the household after her parents died in a car accident last year. She must care for a 9-year-old sister and 67-year-old grandmother. "I teach my sister to study, take care of Grandma, do errands and household chores," she said. Like too many children in Korea, Han-na has assumed adult responsibility and does so with assurance. At as young as 10, these children are raising siblings, cooking and cleaning -- while attending school and earning money outside the home. The Honolulu Hibiscus Lions Club thought they needed a break, and brought Han-na and eight other children in similar circumstances to Hawaii for a seven-day vacation last month. The children ranged in age from 11 to 16. Various organizations sponsored luncheons, dinners and special events for the kids. "We bring food and talk to them. It's only one day but it makes them happy," said Kimberly Ching, president of the Korean American Women's Club, which sponsored the day at the beach. The hardships were not apparent as the kids picnicked at Ala Moana, swam and played volleyball. As a whole, they've taken sad tales and turned them into success stories for their families. Many even expressed the desire to enter professions that give back to the community. "I want to be a teacher," Han-na said. "Teaching kids would be fun." Child abandonment is a problem everywhere, Hibiscus club President Scott Kim said. Every society has orphanages, but the club decided to focus on the kids from Korea. "These kids are the boss in the house," he said. "The government helps, but they do not get too much money." He said the club hoped to give the children an American experience they would otherwise never have. After swimming, Song Min-ah, left, and Park Oak-jeong enjoy a picnic in the park. Kwi Suk Maemoto is serving. "What they want most is to be like normal kids," said Yi Sun Yong, a Catholic social welfare worker from Korea. "They want a mom and dad, to go to the swimming pool and take piano lessons." Since none of that will happen, the best they can hope for is moral support from the community, she said. "The kids are very well adjusted but need consistent care and attention. What they can use is stability." Sun ok Smith, a Lions Club member, hopes the trip provided some hope and that the children gained lifelong memories. "Our object was to provide educational experiences to enhance the children's learning and to minimize stress from the daily responsibilities that is their burden as young household heads," said Smith. The group went on daily excursions including a tour of Oahu, snorkeling at Hanauma Bay, a Diamond Head tour with University of Hawaii Korean students and made a visit to the state Capitol. They even met the governor. Smith hopes to find families to sponsor these children in for visits during their school vacations. "These children need to learn English to succeed." Yong hopes to set up an e-mail exchange or pen pal program for the children with American youths. 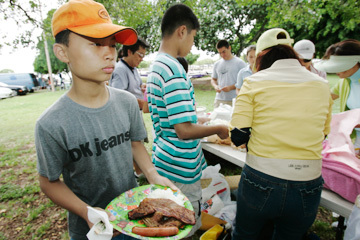 Park Jin-soo enjoys a picnic in Ala Moana Park hosted by the Hibiscus Lions Club and the Korean American Women's Club. Seventh-grader Song Ji-ching and his sister, fifth-grader Min-ah, were abandoned by their mother, who took them to their aunt's house one day and never returned. She left without a word and has not made contact since. Their parents had divorced due to gambling and family violence. Still, the siblings have mustered the strength to contribute to the household. Ji-ching helps his sister with her studies and does chores. He wants to finish school and become a policeman. Min-ah hopes to be a teacher. "There is no hardship that we cannot endure," Ji-ching said. Did the visit make a difference? "I know I have to face reality once I go back to Korea," 16-year-old Kim Ja-yeon said. "My reality hasn't changed but my outlook is more bright. "We have so much support and encouragement here. I feel like I stepped more forward, toward my goals." By the end of the week-long vacation, the kids had really started to open up, said Smith. "At first they were like turtles, holding everything inside. I spent the whole time with them and felt like a mother figure." The children have e-mailed Smith with expressions of gratitude. "They said it is tough to deal with reality again, but they are trying hard. They prefer life in Hawaii. I think they miss the love and care most," she said. The social workers from Korea also have sent e-mails to Smith since the group returned to Korea. She added, "They are so surprised at how much they have changed ... especially their expressions, they are smiling lots more." Sun ok Smith translated for the children featured in this article. Contact her at 261-0509 or Scott Kim at 382-8771 to learn more about ways to help or for information on becoming an e-mail/pen pal.